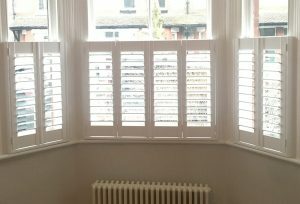 Choosing the right shutter style for this beautiful terraced home in Hale was simple. 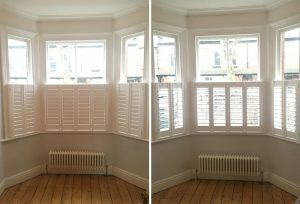 Our client in Hale, Cheshire, was looking for improved privacy to their gorgeous front bay window, without losing the natural light to the room. As the property was close to the roadside they felt too overlooked, but didn’t want to cover the whole window. 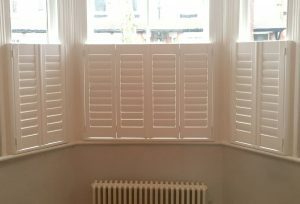 We suggested that our Café Style Shutters were the perfect solution, offering privacy lower down but allowing light to flood in from above. 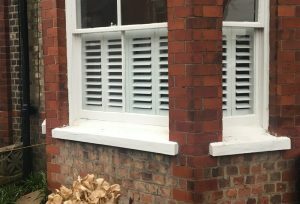 The client chose the Café Style in our Antigua range with 76mm wide louvers painted pure white. 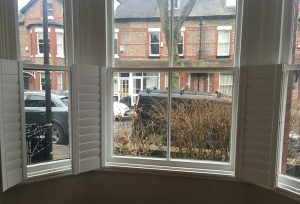 This was complemented with our silent tilt rods to give a clean, sleek finish which really complements the bay window both from inside and outside. 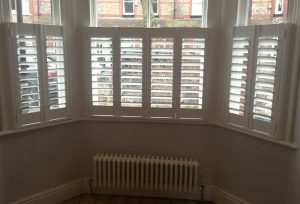 If you like to look of our fitted café style shutters, get in touch or call us on 01270 619 006 and find out how our shutters can transform your home.